Sudden itching of your skin may range from being slightly annoying to constant and severe. 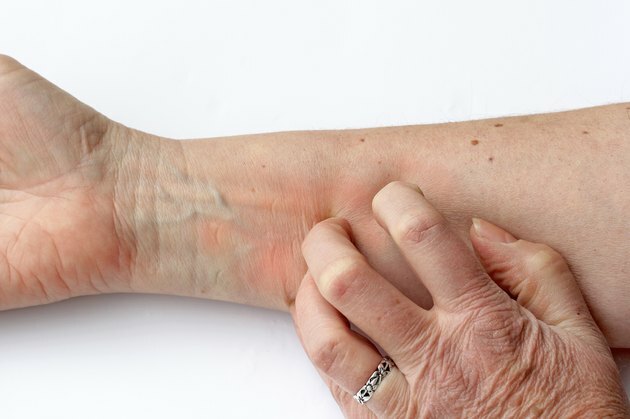 On many occasions, simply having a close look at your skin will allow you to see what is causing the itching -- whether it is from a bug bite or an allergic reaction. A close look may not always help you determine the source or cause of the problem. Although it may be difficult, try not to scratch the area. Seek treatment for any itching that causes pain or other side effects. Poison ivy, poison oak and poison sumac each contain urushiol -- an oil that, when in contact with your skin, causes an allergic reaction that consists of an itchy rash. This rash may develop through direct contact, indirect contact or airborne contact, according to the American Academy of Dermatology, or AAD. Poison ivy and poison oak may be identified by their three distinct leaflets, while poison sumac has between seven and 13 leaflets. The AAD reports that approximately 85 percent of people who come in contact with one of these plants develop an allergic reaction. If an allergic reaction occurs, wash the affected area thoroughly with lukewarm water and a mild soap. Because the urushiol will remain active over a long period of time, it is also essential to wash all of your clothes and anything else that has come in contact with the plants. To ease the itching, taking a bath in a mixture of water, baking soda and oatmeal may help. Jock itch, which is also known as ringworm of the groin or tinea cruris, is a groin infection that is caused by the growth of fungus. The condition is found primarily in adolescent boys and grown men, but girls and women may develop it as well. According to MedlinePlus, jock itch occurs in areas that are warm and moist, and it frequently appears at the same time as ringworm and athlete’s foot. Wetness in the groin from sweating and friction from wearing clothing are the most common reasons for jock itch. Jock itch will typically be found near the creases of the upper thigh, and it can be identified by the sudden itching of the groin area and red, scaly patches of skin. An over-the-counter drying powder or anti-fungal medication may resolve normal cases, while severe infections may require prescription anti-fungal medications. Allergic reactions occur when you come in contact with a substance that sets off an immune response in your body. According to the University of Maryland Medical Center, the most common allergens include dander from animals, pollen, bee stings, plants, certain foods, medicines and insect bites. The common signs and symptoms include itchy skin, hives, watery eyes and rash. Difficulty breathing, trouble swallowing, nausea, vomiting or pains in the abdomen may be indicators of a severe allergic reaction and require immediate medical attention. Most mild allergic reactions are treated with a cool compress, calamine lotion and cortisone cream.